Dr. Smith's ECG Blog: 40-something with severe CP. True + vs. False + high lateral MI. ST depression does not localize. This post presents one new case, then reviews some interesting aspects of high lateral MI and of ST Depression in "inferior" leads. Down below are 3 more cases and a discussion of how to differentiate false positive isolated STE in aVL from True positive. A 47 year old male called 911 for severe chest pain. He was clammy and looked unwell. He had a previous MI with cardiac arrest 2 years prior. There is very subtle ST elevation in I and aVL, with very subtle ST depression in III and aVF. Is this due to coronary occlusion? This is a posterolateral MI. Probably due to occlusion of the circumflex or one of its obtuse marginal branches. 2. There is a down-up T-wave in aVF. Down-up T-waves in inferior leads are almost always reciprocal to ischemia in the territory underlying aVL. 3. ST segment in V2 has minimal ST elevation and is very flat, and the one in V3 is actually subtly downsloping. This is not normal and is a tip off that there is posterior ischemia accompanying the ischemia in aVL. Together they strongly suggest a circumflex lesion. The medic activated the cath lab but was refused by the interventionalist, who did not believe that this ECG represented acute coronary occlusion. Later, the patient was taken to the cath lab. The artery was occluded. It was opened and stented. I could not get details on which artery, but I'm sure it was the circumflex. "STEMI" is defined by millimeter criteria (1 mm in limb leads), which this does not meet. Therefore it is not a STEMI. But what we truly care about is coronary occlusion, for which STEMI is just a surrogate that is only about 75% sensitive for occlusion. When there is ischemic ST depression localized to the "inferior" leads, it is more likely to be reciprocal to ST elevation that localizes to the high lateral wall (aVL), even though that ST elevation may be nearly invisible. The ST depression may be the most visibly obvious sign of STEMI. 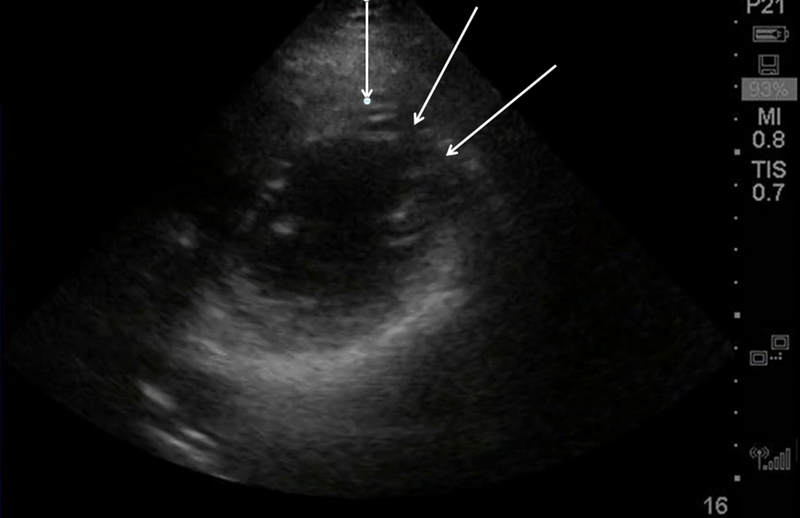 A woman in her 60s with no prior history of CAD presented with 3 hours of sharp, centrally located chest pain with radiation to the anterior neck, with associated nausea. She had known HTN and DM. She appeared to be in distress. She was given sublingual NTG with improvement, but there was not complete resolution. There is ST elevation in I and aVL, with inferior reciprocal ST depression in all of II, III, and aVF, and a down-up T-wave in aVF (a sign that is very specific for ischemia). There is also ST depression in V3-V6. This ECG is diagnostic of ischemia. It is important to compare this one with the false positive case #3 at the bottom; that one is a case which could fool you. There is an anterior and lateral wall motion abnormality. 1. LM: No significant stenosis. 3. LCX: Luminal irregularities, no significant stenosis. Two OM branches without significant stenosis. 4. RCA: dominant. Luminal irregularities without significant stenosis. Supplies a small RPDA and RPLA. A large Diagonal artery may supply both the lateral wall and part of the anterior wall. --He remained pain free and the plan remained to admit with a diagnosis of Non-STEMI on medical therapy with plan for angiogram in the morning. --Just before admission to the hospital, the patient admitted to recurrent pain and appeared uncomfortable. Therefore, the cath lab was activated urgently. --The suspicion was for a circumflex (or obtuse marginal branch) or diagonal artery occlusion or subtotal occlusion. --At cath, there was a 95% proximal LAD stenosis with TIMI-II flow, proximal to a large diagonal. A stent was placed and the patient became pain free. And here is a similar one that is NOT MI. How do we tell the difference? There is ST elevation in I and aVL, with reciprocal ST depression in lead III. 2. The reciprocal ST depression is in lead III only. Not in leads II and aVF. 3. There are distinct J-waves in the two leads with ST elevation. This is highly suggestive of early repolarization in these leads. 5. There is ST elevation in V2-V4 that is clearly due to early repol. Early repol in aVL should be accompanied by early repol in the "anterior" leads. 6. Angiogram if necessary. You don't want to miss an occlusion. GREAT post! Dr. Smith thoroughly covers all essentials in this case. A few quick thoughts I’d add are: i) Shape is much more important than amount of ST segment deviation. The shape of the ST-T wave in the original ECG presented in this case is clearly abnormal in multiple leads (the subtle-but real ST elevation in leads I,aVL; reciprocal ST-T wave changes in leads III,aVF; and either flat ST segment and/or abrupt angulation in the area of transition between ST segment and T wave in leads II and all 6 chest leads). Other than perhaps aVR — there are no truly normal leads here. ii) Think “mirror image” when looking for reciprocal changes. If you imagined a horizontal mirror running across the tracing in between lead III and lead aVL — then flipping lead III up would give you the picture we see in aVL, and vice versa. iii) Dr. Smith’s pearl about the “down-up” T wave in lead aVF (subtle as it is) — is truly telling (ie, confirmatory). THANKS for posting this case!